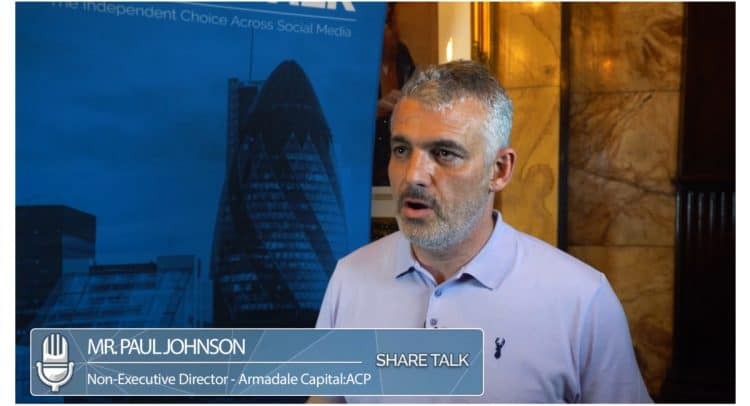 We caught up with Paul Johnson at Share Talk investor show held in London recently and we took the opportunity to record this short interview with the newly appointed Non-executive Director of ACP who was attending the event. Mr. Johnson is an experienced public company director and is a former Chief Executive Officer of natural resource investing company Metal Tiger plc (LON:MTR). He has also previously held the roles of Chairman at ECR Minerals plc (LON:ECR); Chief Executive Officer at China Africa Resources plc (now Pembridge Resources plc (LON:PERE) and Metal NRG plc (LON:MNRG); and Non-executive Director at Greatland Gold plc (LON:GGP), Papua Mining plc (now Rockfire Resources plc LON:ROCK) and Thor Mining plc (LON:THR). Armadale Capital Plc is focused on investing in and developing a portfolio of investments, targeting the natural resources and/or infrastructure sectors in Africa. The Company, led by a team with operational experience and a strong track record in Africa, has a strategy of identifying high growth businesses where it can take an active role in their advancement. Its current key focus is the Mahenge Liandu graphite project in south-east Tanzania, located in a highly prospective region with a high-grade JORC compliant inferred mineral resource estimate of 51.1Mt @ 9.3% TGC. Marking the project one of the largest high-grade resources in Tanzania, and work to date has demonstrated Mahenge Liandu’s potential as a commercially viable deposit with significant tonnage, high-grade coarse flake and near surface mineralisation (implying a low strip ratio) contained within one contiguous ore body.